The first of these happens next week. Generally, the text agreed by the JURI committee would immediately become the basis of a "Trilogue" negotiation between the Parliament, the European Commission (the EU's executive) and the European Council (representatives of its member states). What comes out of that negotiation becomes EU law — and with the JURI vote, all three groups have agreed to include copyright filters and link taxes in the final directive. However, given the controversy over the directive's contents, we expect some MEPs will invoke "Rule 69(c)" next week. That would lead to a vote of the full Parliament on the JURI text as a negotiating mandate, probably on July 5th. As Julia Reda, the Pirate Party MEP explains in the interview below, with enough noise, it may well be possible to get a majority of the Parliament to oppose the JURI decision. That would re-open the directive's text, and allow ordinary MEPs to vote on amendments. Even if we don't get a majority then, it'll will be important groundwork for the next, highly unusual step: another plenary vote for on the negotiated directive some time later this year. Will they rise to the challenge? Most MEPs — like most Europeans — were unaware of the controversy surrounding Article 11 and 13 until this month. Right now, they're being heavily lobbied by the regulations' supporters: but they're also hearing from thousands of their constituents. As Reda says, do a little research on where your MEP stands on the issues. Right now, progressive MEPs are being told that Article 13 and 11 will teach the big tech companies a lesson and defeat fake news (no, we still don't understand that one); and conservative MEPs are being told that Europe's businesses support these new property rights. These arguments are deeply misleading — Google, Facebook, Apple and other giants are rarely happy with new regulations, but they'd be able to comply quickly and easily with Article 13 and 11, unlike any emerging competitors who would have no negotiating powers to gain new licenses or build copyright scanning tools. And while it's true that the multinational media and rightsholder conglomerates have pushed for the link tax and the copyright filters, there are many other businesses and non-profit groups that would be caught in the directive's filtering and licensing net. You don't have to be on the right or the left to decry this directive: the primary community it will affect doesn't have lobbyists in Brussels. They're just ordinary Internet and digital technology users and creators. Europe's lawmakers need to understand that the details of digital copyright are more than just a deal to be brokered between commercial giants — they're a matter of free expression, privacy, and human rights. 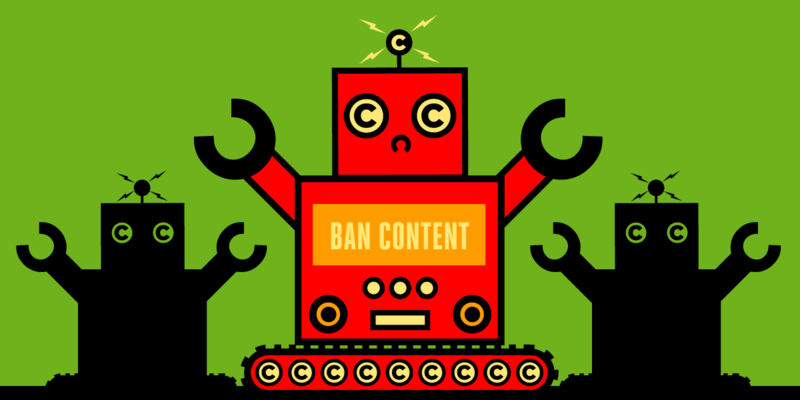 That's why the United Nation's human rights experts oppose these articles; why Wikipedia and Creative Commons are fighting it; why the Internet's pioneering technologists and creators told the EU to think again. And that's why your MEP needs to hear from you.